It no longer surprises me when an oncology drug developer tells me they have been contacted 12 times in one week about career opportunities. 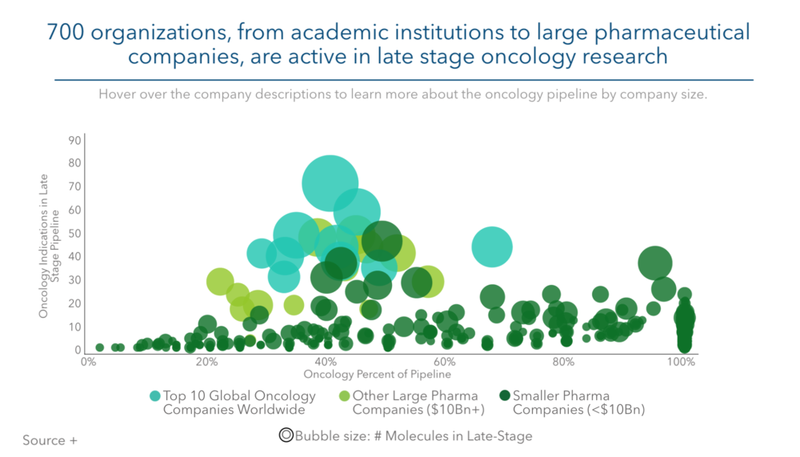 It is clear that the oncology space has become the most competitive space in industry. With over 1,600 clinical trials running, each requiring medical input from a trained physician, the competition for talent in the oncology space is as fierce as any area in any space at any time in the history of the industry. This only scratches the surface as the number of clinical trials quoted does account for reformulation, biosimilars or post-marketing trials so the real situation is far worse. And the problem, already acute, is set to get more alarming. There are 700 organisations involved in late stage development in oncology alone all fighting over the same talent pool. The boom experienced in the oncology space which has lasted for 10 years and has seen a 40% increase in the initiation in clinical trials, is set to continue with new cutting edge methods in immuno-oncology, CAR-T, PDL-1 inhibitors and advanced therapies being put forward as the next silver bullet. For companies looking to hire, it’s a high wire act. The rewards are great for those who bring together the right team and make it to market as they carve out a share of a market estimated by IQVIA Institute for Human Science to reach $200BN in 2022. Conversely, the pitfalls are all too evident for those who make the wrong hire or the fail to hire in the right time frame. Integral to the success of businesses are experienced drug development physicians. So how do companies go about finding talent in a hyper-competitive market? Start early and make time for your search - factor a minimum of 6 months from inception to start date of candidate. It is also a big investment of time and emotion for all involved. Determine your strategy with your intermediary, create a compelling message with lots of data. By their very nature, physicians are highly analytical and data driven. A job description with a 10 bullet point list of generic responsibilities is doomed to fail. Run a streamlined process, holding your intermediary to account and be fast. Feedback within 48 hours, use of videoconferencing, and quick action will help keep the candidate engaged. Be flexible – not only on the profile but title, remit, working conditions such as location will greatly enhance the company’s chances of success. As the European oncology world gathers in Munich for ESMO, I wonder how high up on the agenda is the competition for talent and physicians? How hard is it to find development physicians? Which recruitment strategies are working? Look forward to hearing from you and good luck to all! Pierre Matthews, Managing Director of Life Science Medics - a global executive search firm specialised solely on the recruitment of physicians in industry – that has this year helped multiple companies recruit oncology physicians, including three Chief Medical Officers, several oncology consultants and several director level functions. And for companies looking to future-proof your talent acquisition strategy in this space, I would be delighted to give you insight into a new unique online solution that will put you ahead of the game – Faber - just follow the link and complete the form. Setting up a European medical infrastructure for a US biotech preparing for commercialisation is possibly one of the most exciting challenges that one can find in Medical Affairs. We recently interviewed the Vice President of a successful US biotech company in the orphan drug area, who set up a European medical infrastructure in readiness for the launch of a high-profile drug. We asked him what worked and didn’t work. The role of the Chief Medical Officer could be one of the most misunderstood roles in industry. Many of the aspiring medics I talk to assume that a CMO’s role consists entirely of devising high-level strategy from a corner office with a view and travelling first class to meet key opinion leaders around the world. The reality is very different. When considering the next step in your career there are a number of factors you need to take into account to evaluate what the best option is.